The minute you enter this room, you feel the soothing effects of a unique sanctuary. The interior offers the ultimate in modern design inspired by Mykonian lines and color. Luxuriously minimalist, the room breathes purity and sophistication. Featuring four poster queen sized bed or two twins, exquisite marble bathrooms with relaxing Jacuzzi tub, this setting evokes serenity and style. 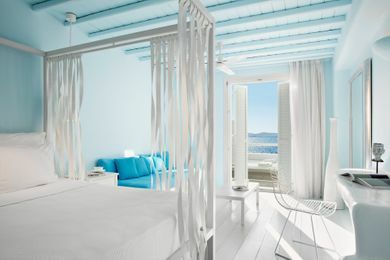 Savour the captivating sea views from the charming balcony. A perfect sybaritic escape.